1. A book that literally made me cry from laughing so hard. 2. I pulled an all-nighter to read this book. 3. A professor confirmed the accuracy of the department politics and meetings. 4. She pulled an all-nighter to read this book. 5. Strange fact: every time I see an Aflack Insurance commercial with the duck, I think of how ridiculously funny this book is. What books crack you up? 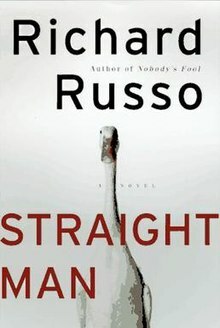 This entry was posted in Books I Love, Library Love and tagged National Library Week, Richard Russo, Straight Man by Teacher Goes Back to School. Bookmark the permalink. I second your emotion. This book was very entertaining, in the plot but more just cuz you feel like you’re right inside his silly head… getting the dirt on how it feels to be a man, at least a Russo-man. Could not put it down. @tess: i didn’t know you’d read this. man, i love this book. a serious look inside a silly russo-man indeed. i may have to read it again. again. @nancy: i’m a huge sedaris fan as well. naked, barrel fever and me talk pretty some day are my favorites. we have all the books and we have all the books on tape. makes for excellent listening on roadtrips. nothing like an author reading their own work to make one laugh out loud.